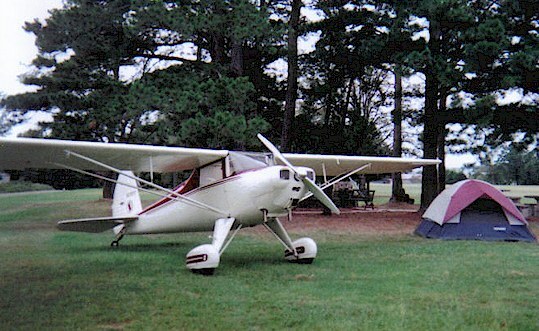 Here are some photos of my Luscombe. It's a 1946 8A with a 65hp Continental. It was restored in 1993 and when I bought it in 1999 it had only 40 hours on the overhauled engine. So far I haven't had to do much in the way of repairs, and it's a good thing because I've been too busy flying it! I only had 9 hours of tailwheel time when I bought the plane. I now have about 650 hours in the Luscombe and it has taught me a lot! During that time I've gone to Big Bend, through Palo Duro Canyon in Amarillo, Detroit, Oshkosh (2000, 2001 & 2006), Sun & Fun, and Lawrence Kansas. Traveling in an airplane that cruises at 95 mph is an exercise in patience, but you really see the country down low and slow. I've enjoyed almost every minute of flying this plane and can't imagine ever parting with it. There's just nothing like flying a Luscombe! The first photo was taken at a residential airport on Lake Tenkiller in NE Oklahoma. The 2nd was taken outside its hangar at Aerocountry. The 3rd is an aerial shot taken soon after I bought the plane.